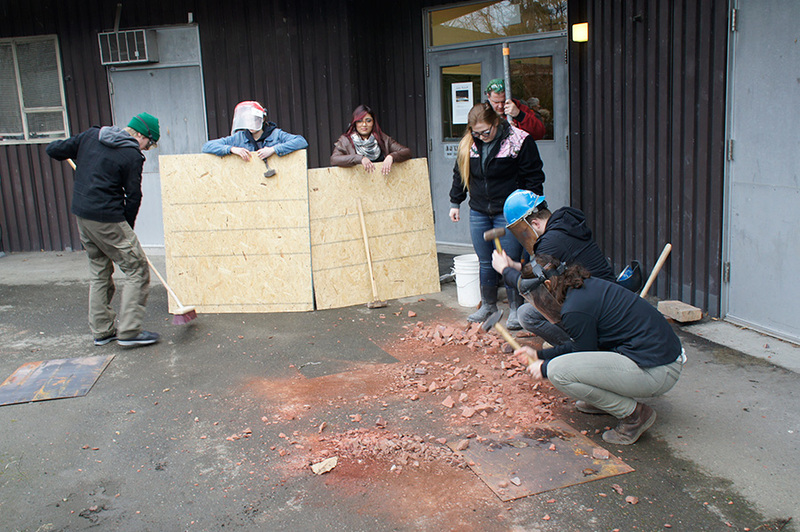 Bottom: UW students pulverizing kiln bricks to make grog for Phase II of Mineral Scatter component. 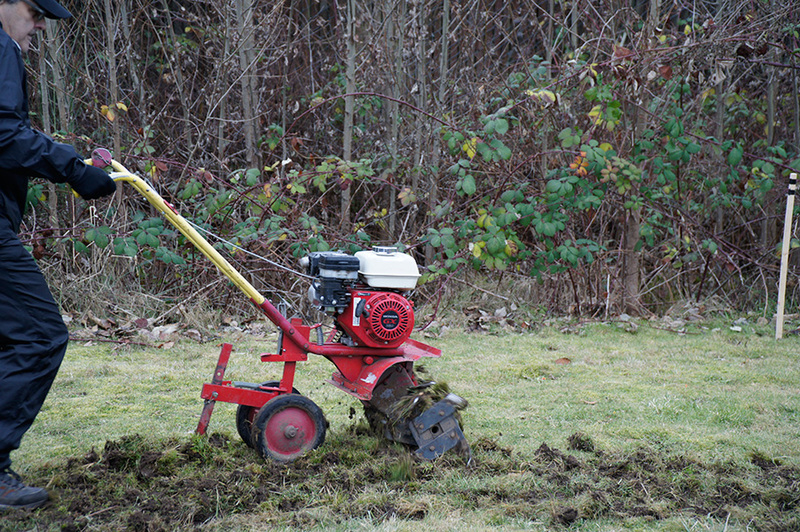 Top: Tiller component / rented gasoline powered rototiller, Puget Sound sediment. Bottom: Auger component, gasoline powered auger, John Roloff & Michael Swaine, Puget Sound sediment. Top: site view showing Auger and Tiller components with excavated Puget Sound sediment. 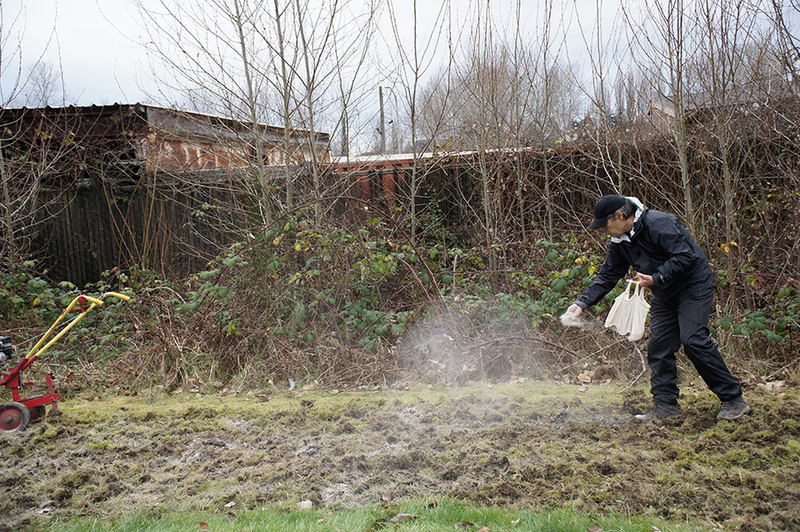 Bottom: Phase I Mineral Scatter component, John Roloff, volcanic ash, dolomite and related ceramic minerals. A geologic site study revealed two available Quaternary, surficial, strata for physical investigation using a motorized tiller and auger seen as clay tools performing in the context of an expanded definition of ceramics that includes: agriculture, geology and the landscape. Two strata were within reach of the project, the uppermost an approximately 1 meter deep Holocene deposit of Lake Washington peat overlying 1 to 10 meter Pleistocene glacial tills left by receding glaciers. A preliminary video edit of the project and sediment bricks described below were used in the exhibition, Diderot/Forrest/Roloff at NCECA 2017, Portland, OR. Long-term investigations of ceramics as a function of geologic materials and processes as well as inspiration from Diderot’s Encyclopedia were instrumental in the development of this project. 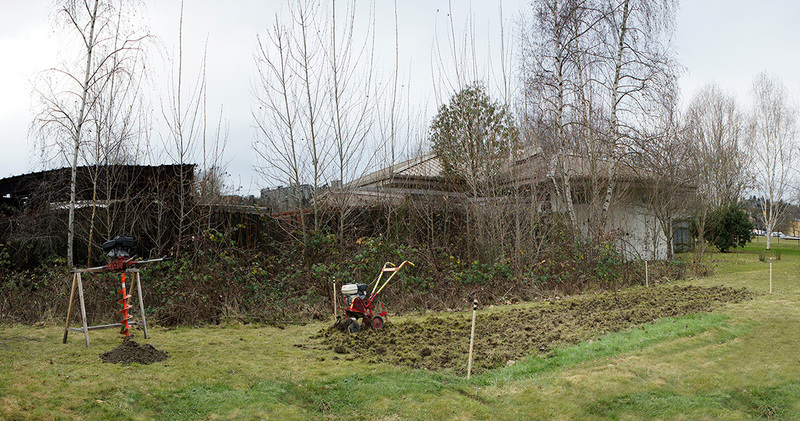 An area of approximately 20 ft x 45 ft (the floor plan of a portion of the 2017 NCECA exhibition site in Portland OR) is opened up to the sky using a 20th century mechanical tiller. For Phase I and II of Mineral Scatter component, the area was “planted” with nutrient ceramic materials (Phase I - volcanic ash, dolomite and related minerals) and brick grog (Phase II) from the UW kilns crushed by UW ceramic students, the area was replowed to work the materials into the disturbed sediments. The project exists in video and submerged earthen state that may enhance future plant growth, practical and conceptual use of the site. Future versions of this project for other sites are being considered using a traditional horse-drawn plow as a tool. 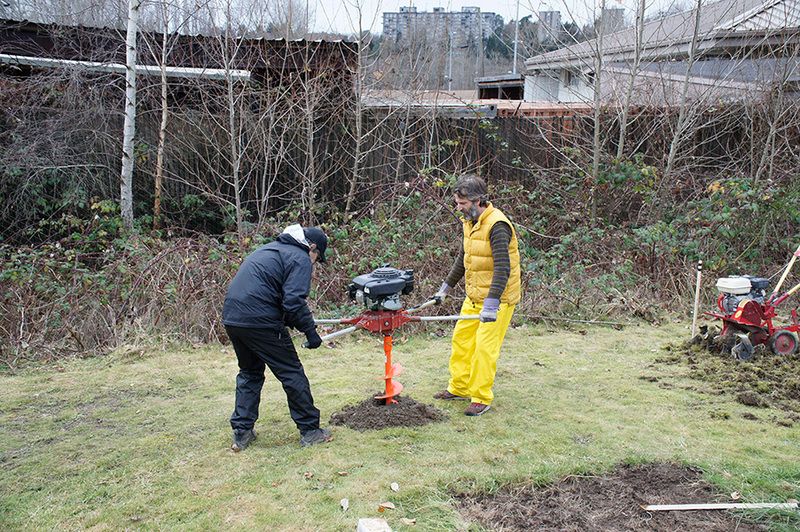 A single vertical hole 1.5 m deep was dug using a 20th century mechanical post hole auger to discover and expose past organic and clay materials From the Holocene Lake Washington deposits (seeking the buried Pleistocene glacial till beneath). Fired ceramic bricks were made from some of the excavated materials, the auger cavity was replaced with used kiln bricks from the UW kilns mixed with the remaining excavated sediments.